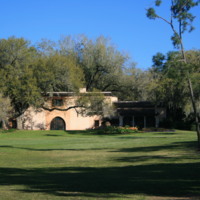 The Pinewood Estate at Bok Tower Gardens, located at 1151 Tower Boulevard in Lake Wales, Florida. The Pinewood Estate is a mansion that was constructed for Charles Austin Buck, the vice president of the Bethlehem Steel Corporation. In 1929, William Lyman Phillips, an architect at Frederick Law Olmstead, Jr.'s (1822-1903) firm, began designing the gardens. 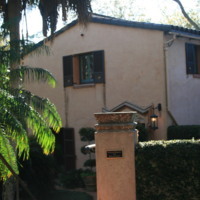 In 1930, Charles Wait began designing the house in the Mediterranean style of architecture. Originally called "El Retiro," which means "The Retreat" in Spanish, the estate was acquired by Nellie Lee Holt Bok , the daughter of Bok Tower Gardens founder Edward W. Bok (1863-1930), and renamed the "Pinewood Estate" in 1970.These images were taken by Russell Moore in 2010. Original color digital images by Russell Moore, March 7, 2010: Private Collection of Russell Moore. Lake Wales Collection, Polk County Collection. RICHES of Central Florida. Originally created by Russell Moore. Copyright to this resource is held by Russell Moore and is provided here by RICHES of Central Florida for educational purposes only. 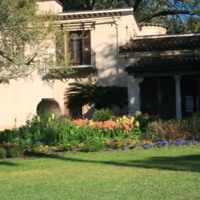 "About Bok Tower Gardens." 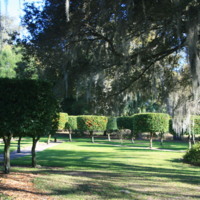 Bok Tower Gardens. 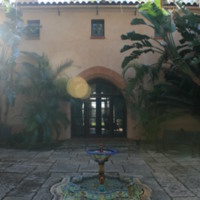 http://boktowergardens.org/. 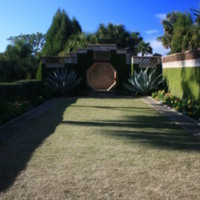 "Bok Tower Gardens," Floridata, http://www.floridata.com/tracks/GardenGallery/bok/bok1.cfm. Bok Tower Gardens (Lake Wales, Fla.). 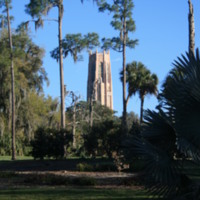 Bok Tower Gardens. Lake Wales, Fla: Bok Tower Gardens Foundation, 1981. Bok Tower Gardens (Lake Wales, Fla.). 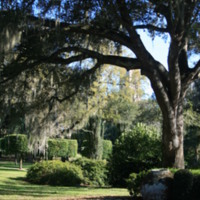 The Bok Tower Gardens Newsletter. Lake Wales, FL: The Gardens, 1980. Moore, Russell. 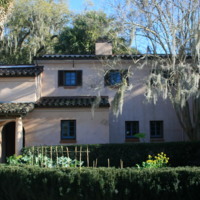 “Pinewood Estate at Bok Tower Gardens.” RICHES of Central Florida accessed April 21, 2019, https://richesmi.cah.ucf.edu/omeka/items/show/5074.